Regiment/Catrawd: 15th (The King's) Hussars. Service Rank and Number / Rheng gwasanaeth a rhif: Corporal No. 10201. Military Cemetery/Memorial / Fynwent milwrol: Hop Store Cemetery, West-Vlaanderen. Ref No Grave or Memorial / Rhif cyfeirnod bedd: Plot: 1. Row: D. Grave: 21. Medals Awarded / Medalau a ddyfarnwyd: 1914/1915 Star, British War Medal, Victory Medal. Died of wounds received in action on Thursday 13 May 1915, aged 21 years. Jasper Pope was born in Ardwick, Manchester, Lancashire, England on 7 January 1894. The 1911 Census shows that the family lived at 3 Crescent Road, Rhyl, Flintshire, North Wales. The head of the family was Ebernezer Henry Pope aged 58, who was employed as a Clerk in a Loan Office. His wife Mary Pope (nee Bancroft) aged 54 and their three children – Stead Pope aged 23, a Clerk and Telegraphist, employed by the Post Office, Jasper Pope aged 17, also employed by the Post Office as a Clerk and Annie Joan pope aged 14 years. Jasper enlisted at Hightown Barracks, Wrexham, Denbighshire, North Wales with the Denbighshire Hussars Yeomanry, later transferring to 15th (King’s) Hussars. He arrived in France on Sunday 16 August 1914 and died of wounds received in action on Thursday 13 May 1915. He did receive a Distinction Award Commendation for Conspicuous Bravery. Jasper’s elder brother Stead Pope also served during the First World War. He was a Sapper in the Royal Engineers, Togoland Field Force. Togoland was a German Protectorate in West Africa. At the outbreak of the First World War in 1914 the Colony was invaded by British and French Forces during the Togoland Campaign and placed under military rule. The Rhyl Journal – Saturday 20 March 1915 – 15th Hussars. Corporal Jasper Pope writing from the front to some of his friends in Rhyl states that he has been for a short time ‘Struck off the pleasant occupation of the Hun extermination’, but he hopes his Rhyl friends who have recently enlisted will soon be joining him out there for the march to Berlin. There is nothing exceptionally heroic in coming out to this country he remarks. You get plenty of excitement and sight-seeing and if you get knocked over, it is merely your bad luck. Up to the present my luck has been good and I shall remain standing. AS our Chaplin told us the other day, we were born to work. Denbighshire Free Press – Saturday 29 May 1915 – Captured German Flag. Mr W A Lewis, Headmaster of Rhyl County School has received for presentation to the school, the German flag captured in Togoland. It was sent to him by an old pupil of the school, Mr Stead Pope of Rhyl, who was present at the first battle, and was the first Britisher to enter the town in which the German flag was flying. The Rhyl Journal – Saturday 5 June 1915 – Rhyl Soldier in the Casualty List – Corporal Jasper Pope, 15th Hussars whose letter from the front, published in our last issue of three week’s ago, referred to two local men out there since reported killed, has now, after being nine months in the fighting line, entered the casualty lists himself. His parents in Crescent Road, Rhyl, have this week received information from the War Office that he was wounded in action and admitted to hospital abroad on the 13th May. As during the intervening time, now three weeks, he has not communicated direct, it is feared his injuries may be serious. However we hope for the best. Flintshire Observer Thursday 10 June 1915 – Rhyl’s Sacrifice – Rhyl Soldiers have of late figured very prominently in the casualty lists, about a dozen having been reported killed and many wounded. Last week the War Office notified the relatives of the death of Lance Corporal William Jennings, Private Albert Williams and Private James Jones, all of the Royal Welsh Fusiliers, who were killed in action about the middle of last month. It has also been reported that Corporal Jasper Pope of the 15th Hussars, who had been in the war from the beginning and Rifleman W. H. Evans, 5th Kings Liverpool Regiment had been seriously wounded. 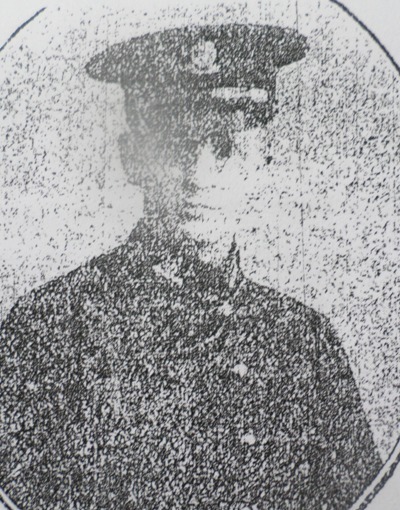 Flintshire Observer 1 July 1915 – Rhyl Man Killed – News has reached Mr E H Pope, Crescent Road, Rhyl that his son Corporal Jasper Pope, 15th Hussars has been killed at the front. The deceased was formally in the Rhyl Post Office and a member of the Denbighshire Hussars. He joined the army and was promoted Corporal just before the outbreak of the war, leaving England with the first draft of the Expeditionary Force, and took part in the preliminary engagement which led to the battle at Mons. He had not been able to obtain leave to come home, but his letters were always of a cheerful character and he once described himself as being as ‘fit as a nail and twice as dirty’. He also described his experiences as sleeping one night in a chateau and the next in a hen-coop. The Rhyl Journal Saturday 3 July 1915 – Rhyl Telegraphist at the Front. Writing to friends in Rhyl from ‘somewhere in Belgium’ thanking them for gifts received (including some ever welcome cigarettes) Arthur Jones, formally of Rhyl Post Office staff, and now serving at the front as a Telegraphist, states – I cam across Jasper Pope’s regiment (the 15th Hussars) the other day, and much to my surprise found that he had been wounded. His pals gave me a royal time, and made me stop for tea. I learned that Jasper was being moved to a base hospital. What a time we would have had if he had been with us. I was told that he was a very popular boy and a splendid soldier. He was the youngest N.C.O. in his regiment, and his men had every confidence in him. I knew that Jasper would make a fine soldier. (since this letter was written the news has been received in Rhyl, and was published by us last week, that Jasper Pope, who was a former colleague of the writer at the Rhyl Post Office has died of his wounds. The Rhyl Journal 3 July 1915 – The Late Corporal Jasper Pope – An Appreciation by a Friend. Gratitude and affection alike constrain us to pay tribute to the brave, and lay our humble wreath on his distant, and to us unknown grave. Among the gallant youths who in their thousands so fearlessly face their country’s foes and lay down their lives on the altar of freedom and patriotism the name of Corporal Jasper Pope will be affectionately remembered by a host of friends in our town for a generation. He was sent to the front at the very commencement of the great war in August, and during those weary winter months of waiting and fighting maintained quite a characteristic cheerfulness and courage. His letters home to relatives and friends were optimistic in the last degree, without a word of murmur or complaint. He had among other things the distinction of attaining his majority on the field of battle ‘ somewhere in France.’ Our recollection of him is that of a young lad of exceptional sprightliness of disposition and fine, generous impulses – qualities that endeared him to all his comrades at home and on the field. His character and efficiency were recognised by officers in command, who promoted him to the rank of corporal, and had he lived he would certainly have been marked out for higher promotion. Letters from the front bear testimony to the high esteem in which he was held by his comrades-in-arms and their keen personal regret at the death of one so generally loved. We shall never know all he did and endured, but we know that he never spared himself in the strife. Present at the most critical stages of the war – in the famous retreat from Mons, and then at the battles of the Marne and the Alsne – he shared the fortunes of the British Army from the first, had many miraculous escapes, and having contributed his own part in the world conflict, laid down his life in a noble cause. Young as he was, he fully grasped the seriousness of the situation, and was prepared in his own mind for any eventuality. He quotes in one of his letters to his pastor a remark of his chaplain at the front to the men, that ‘they were born to do the work.’ That evidently touched a responsive chord in his own heart, indicating there was some providential inevitableness about this work, and that it would be wrong to shirk one’s responsibility. With such lofty consciousness he fought and fell, with all the hopes and promises of youth unrealised, but setting an example of manly and unselfish devotion to duty. We cherish and honour his memory with all others of our local youth who have been called upon to make the highest sacrifice. On 15 October 1915, a payment of £11. 14s. 2d. was made by the War Office to Mrs Mary Pope, being monies owed to her son Jasper. On 17 July 1919, a further payment which is recorded as a War Gratuity of £6. 0s. 0d. was also made to her. Flintshire Observer 28 October 1915 – Rhyl Man’s Gallantry – Mr E H Pope, Crescent Road, Rhyl has received from the War Office the personal belongings of his son, Corporal Jasper Pope, 15th King’s Hussars who died of wounds in France in May last. Amongst the papers was the following document to the deceased. ‘ Your Commanding Officer has informed me that you have distinguished yourself by conspicuous bravery in the field at Potyze on the 13 May. I have read the report and have forwarded to higher authority with a recommendation for recognition. Mentions in Despatches, Promotions and Decorations cannot be given in all cases deserving of an award, but I should like you to feel that your gallant action has been recognised and to know how greatly it is appreciated. W.H Greenly, Brigadier General, Commanding 9th Cavalry Brigade’. Christ Church Memorial Plaque, Rhyl, Flintshire. 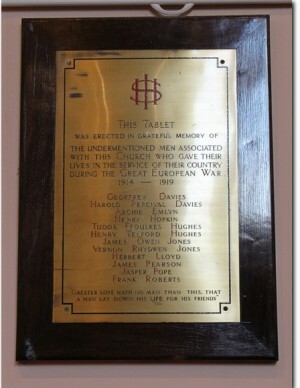 Jasper is also remembered on a Remembrance Plaque at The Royal Alexandra Hospital, Marine Road, Rhyl, Flintshire and on the North Wales Heroes Memorial Arch, Deiniol Road, Bangor, North Wales. There is a Flintshire Roll of Honour Card for him at the County Archives Office, Hawarden, Flintshire, which is undated but signed E H Pope, Father.